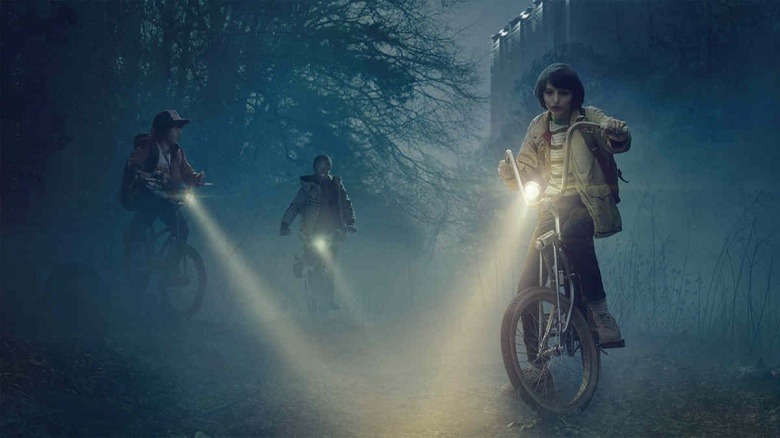 Netflix's Stranger Things has captivated audiences with a satisfying throwback to classic '80s paranormal thrillers that's as bingeable as it is worthy of close attention. 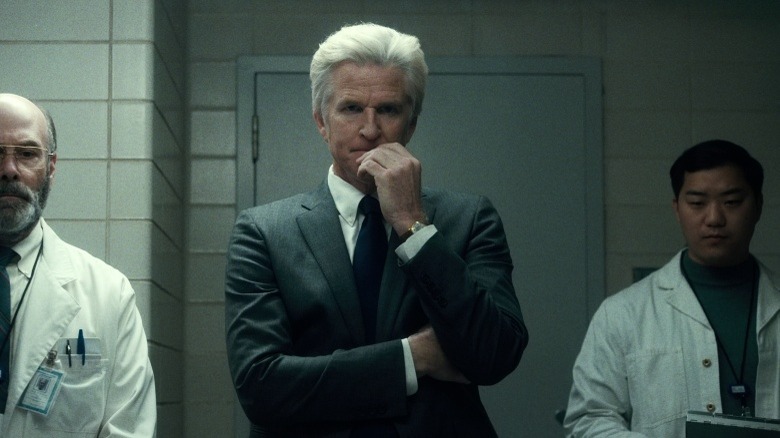 Almost every aspect of the show is laden with Easter egg-style detailing—showrunners the Duffer brothers assembled the show as an ode to their decade of birth, and the history of its creation is almost as fascinating as the series itself. 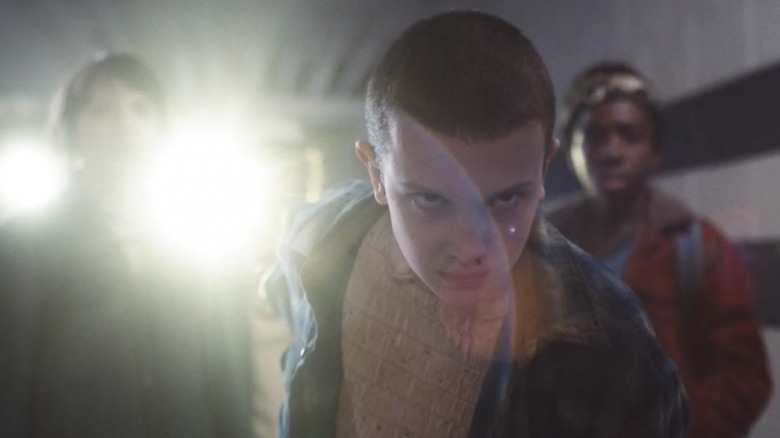 Here's a look at the behind-the-scenes story of Stranger Things. Matt and Ross Duffer, the twin writer-director pair who created the show, showed an early interest in filmmaking, experimenting with home movies as early as third grade. After starting out with an Hi8 video camera their parents gave them, the duo pursued their shared interest in the field by studying film at Chapman University. Their first movie was Hidden, a horror movie which didn't receive wide release but did catch the attention of M. Night Shyamalan, who hired the pair to work on his series Wayward Pines. That hands-on television experience gave the brothers the start they needed to pitch their own series to producers, and with the help of producers Dan Cohen and Shawn Levy, the show was eventually sold to Netflix (but only after being rejected by at least 15 other networks). Stranger Things ended up taking place in Hawkins, Indiana, but the Duffer brothers originally wanted to play with the concept of a waterside setting—specifically Montauk, New York. The region's real-life history may have inspired their story: legend has it that the town's Camp Hero Air Force Base was a lot like MKUltra in very disturbing ways, including serving as the site of rumored government experiments with mind control on kidnapped children. Stranger Things was filmed in the Atlanta, Georgia area, which is also home to a number of television and film productions, so there was just bound to be a location crossover or two for fans to notice. The Bellwood Quarry, where (not-)Will's body is found and Mike is bullied into cliff-diving, was the same site seen in The Walking Dead's first season and in The Hunger Games movies. Your next Hollywood-inspired trip destination has just been booked. To give a sense of what they had in mind for the music of Stranger Things, the Duffer brothers spliced together more than 25 classic movies alongside some of director John Carpenter's "eerie synth drones" to showcase the effectiveness of electronic music with their horror-centric backdrop. 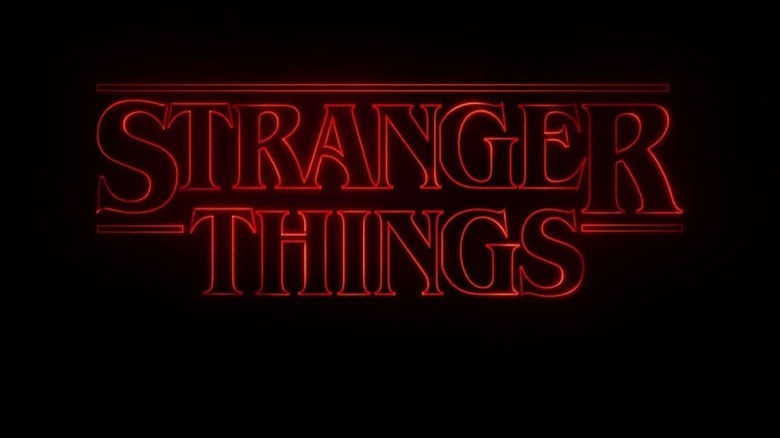 It worked: the soundtrack for Stranger Things, which was composed by Michael Stein and Kyle Dixon, has been heavily in demand ever since the show dropped (although it has also been criticized for pronounced similarities to the Tron: Legacy music). 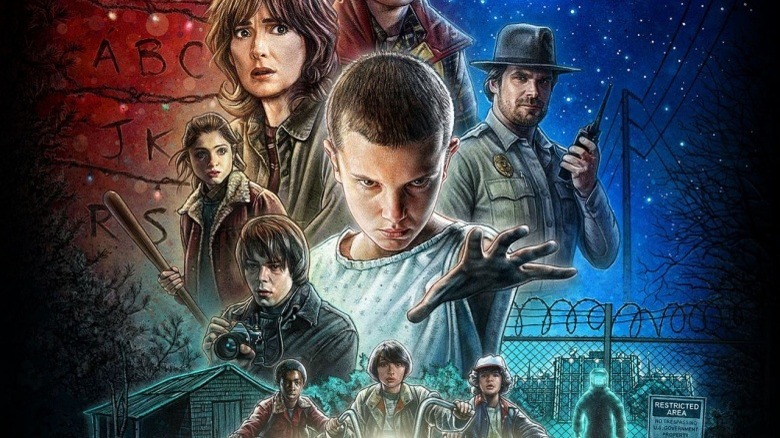 Most of Stranger Things' pop culture references were put in on purpose, and the title art is no exception. It uses a modified version of a font called ITC Benguiat, which has been used on a slew of classic Stephen King book covers (including but not limited to Cujo, Salem's Lot, Firestarter, Pet Sematary, Misery, and The Stand). The typeface, which was designed by Ed Benguiat (hence the name) was popularized in 1978, and has also been seen in the openings for films like Star Trek Generations and Star Trek: First Contact. 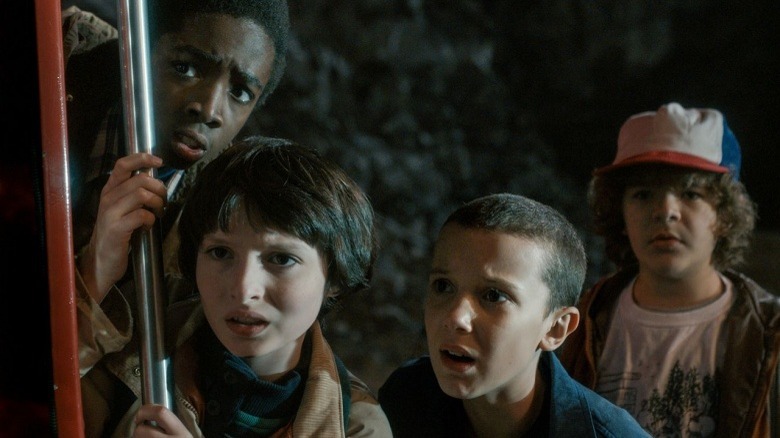 Finding the right child stars for Stranger Things was of paramount importance to the show's potential success because even though there are cast members with higher billing, a lot of the action and intensity revolves around the little scamps. To find the right stars, the Duffer brothers auditioned 906 boys and 307 girls for the roles using scenes from Stand By Me, the 30-year-old Stephen King-based classic that had a ton of influence on their own story. 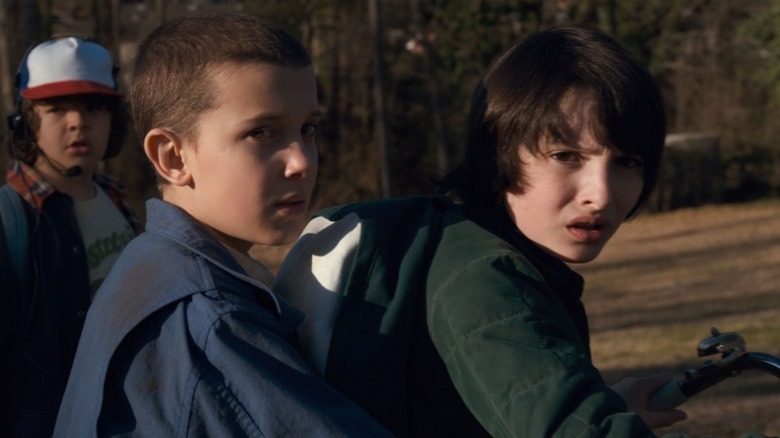 When they finally settled on Finn Wolfhard, Gaten Matarazzo, Caleb McClaughlin, and Noah Schnapp, they were pleased by the immediate camaraderie the boys had with one another (they'd even formed a group text during the summer leading up to production, which made them fast friends before filming began). Settling on Millie Bobby Brown as their Eleven, too, was a moment of win. They sent all of the kiddos home with instructions to watch films like Poltergeist and The Goonies to get a sense of the look and feel of the show to come, and it paid off. The Duffers told EW that on the first day of filming, during which they shot the first scene of the quartet playing Dungeons and Dragons together, the "boys flew through the scene effortlessly and energetically, and their chemistry was electric; they felt like they had known each other their whole lives. 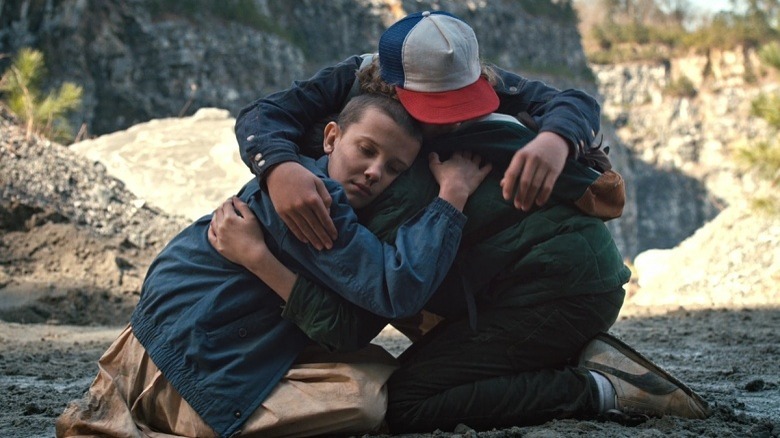 Other than when we sold the show to Netflix, this was the single biggest moment for Stranger Things." Brown, who turned in stunning work as the telekinetically-talented Eleven, wasn't told she'd have to shear off her locks until she'd already won the role, but she came around to the idea pretty quickly after being shown an image of Charlize Theron's buzzcut in Mad Max: Fury Road. She was also encouraged by an old pic of co-star Winona Ryder, who'd sported a pixie cut in her younger days. 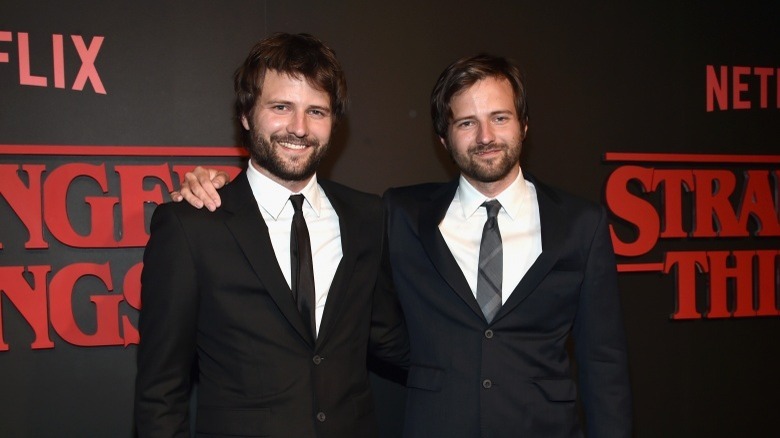 Since the child actors were cast early on, the Duffer brothers were able to sculpt their characters' nuances based on the actors' own idiosyncrasies. For example, Matrazzo really does have cleidocranial dysplasia, which stifled the growth of his top teeth (he's since had surgery to correct the issue) and allowed for him to do that freaky bending maneuver for the bullies on command. Meanwhile, the actor who played Lucas chose his own camo bandana to wear, and the character Steve was given a happier ending than planned because the Duffers found actor Joe Keery to be much more likable than originally intended. Also, the twins who played the littlest Wheeler, Ava, improvised most of their scenes (and were soothed from fears about all the show's monster business by comparing the slimy villain to the characters in Monsters, Inc.). 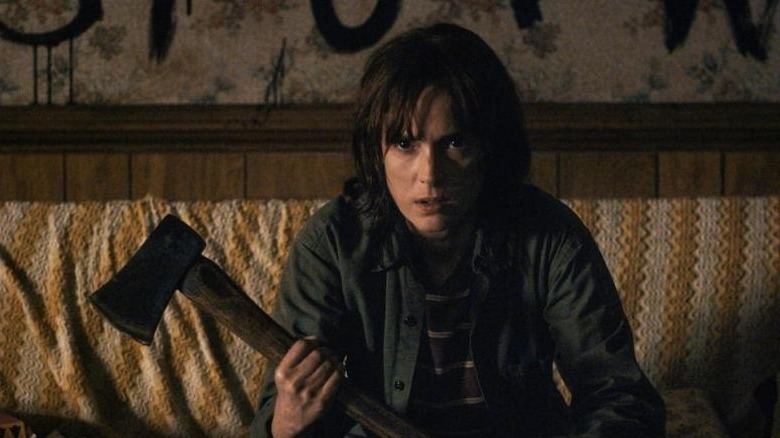 Winona Ryder (also a legend of the '80s thanks to Heathers and Beetlejuice) was one of the first casting picks for Stranger Things, but when she was approached about the show, she had no idea what streaming was (and had little TV experience whatsoever to speak of.) For her character's look, though, she found inspiration in Meryl Streep's performance in Silkwood (which was released the same year as the show's events) and went for the mullet-like bob as a tribute to the Oscar-winning star. 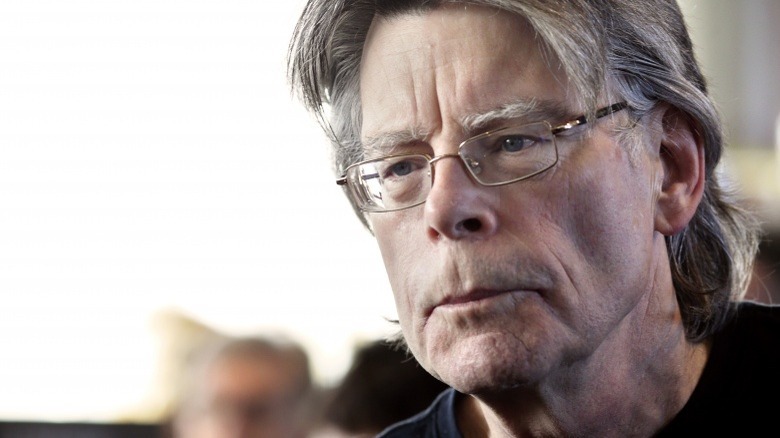 As the single biggest source of inspiration for Stranger Things, Stephen King's praise of the show is worth a lot. The author wrote on Twitter that when he watched the show it was like "watching Steve King's Greatest Hits … in a good way," and graded the program an A for "pure fun." Interestingly enough, Wolfhard, who plays Mike Wheeler in the show, will star in another big Stephen King-inspired property: the upcoming big-screen adaptation of IT, which—full circle!—the Duffers tried in vain to direct years ago.